THIS IS WHERE YOU WILL SPEND YOUR FUTURE! RUN TO THE SALVATION OF BEING BORN AGAIN IN JESUS! "YOU'VE GOT TO BE BORN AGAIN"
Don't wait too much longer. You must give him control. I remember doing my own thing, living without Him. You've got to be Born Again. You've got to be Born Again. then you have gotta get right. and your future is bright. 'Cause if you don't say "yes!" then you are really insa-a-a-a-a-ane. He's there inside me, at my call. He died and rose, for us all. to those who accept him. Step One: We admitted that we are powerless over the sin in our lives and as a result our life actions and attitudes had become unbearable to ourselves and to others, including God. Step Two: We came to believe that Christ Jesus is an actual saving Power, Who can restore us to sanity and wholeness. Step Three: We made a decision to bind our wills and lives over to the care of Christ Jesus, as the New Testament understands Him. Step Five: We admitted the exact nature of our wrong attitudes and actions to God, ourselves and another human being. Step Six: We were entirely ready to surrender our characters' attitudes and actions to be reborn in Christ through the saving Power of His Death and Resurrection. Step Seven: We humbly submitted to the saving Power of Christ's Death and Resurrection through our public confession of faith in Him and Baptism in water and the Holy Spirit. Step Eight: We made a list of all the people we had harmed with our attitudes and actions and became willing to make Gospel based amends to them all. Step Nine: We made direct, Gospel based amends to repair our relationships with such people whenever possible, except when doing so would cause hurt or injury to them or others. 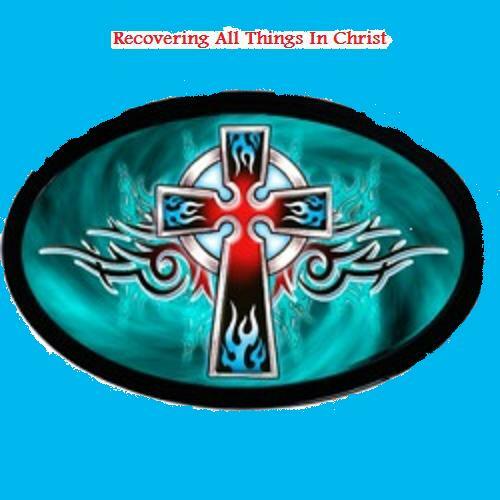 Step Ten: We continued to take personal inventory and when we were wrong in our actions or attitudes we promptly admitted it to ourselves, to God and another human being. Step Eleven: We sought through Bible based prayer, meditation and Holy Communion, as understood in the Gospels, to improve our conscious contact with God, and our care for others, praying for the knowledge of God's will and destiny for us and the Divine Power to carry that will out, one day at a time. Step Twelve: Because of the spiritual rebirth that we experienced as a result of God working through these steps, we carry this Good News to other people struggling in life, and to practice these Gospel principles in all of our affairs. HAVE YOU TAKEN THESE STEPS????? NOW, RUN AND TELL SOMEONE WHAT JESUS DID FOR YOU! Listen to me, children of God. Our Father knows when we are hurt. Be it of flesh or soul. Do you think He would turn you away? NO! Our Father in Heaven made our bodies and souls. Therefore, this drug and that alcohol you feel you need deep down in your soul, you don’t need to make you whole. Remember God can make your souls sing! Just ask our Father to take control. Cast out Satan. Don’t let him be in control. Picture Satan with a smile, just a little too smug. He’ll give you that alcohol or drug. Tell Satan to GO AWAY! You have no home here to stay. Tell your Father you are sorry. He can help take this need away. Come make your home in my heart. Thank You, God for being so smart. Thank You, Lord for being willing to live in my heart. Thank You, Lord; You promised to never abandon me. Thank You for taking me across Your knee! For we all need discipline as well as love. With your forgiveness, we’ll be as pure as a dove. Give me the strength to never do drugs or alcohol again. Ask Him every moment, if the thought appears again. Lord, take this, take this addiction away! This is the only way I can reclaim my life. And receive true peace body and soul. Listen children. The road from addiction isn’t easy. Satan always tries to worm back in, you see. God, give me Your will, show me the way. Father, give me peace of heart and soul. Thank you, Father for never being far away. Our Father said, Listen children, I love you! Listen, children come to me. I will make you see. I’ll give you all the love you’ll ever need. I will meet all of your needs. In Me you can do anything. Miracles like this you’re never seen before. I’ll send Satan and his evil away. Tradition Two: For our group purpose as the Body of Christ there should be only one Ultimate Authority-the Lord God of Love expressed in the Gospels and the influence of the Holy Spirit's guidance through the group conscience. Our leaders are trusted servants, they do not exclude or dictate, but lead through anointed gifts and examples. Tradition Three: The only requirement for joining the Church is a desire to have a new life in Christ. Hence, we refuse none who want to find the Lord and change through His Cross and Resurrection. We refuse no adult from participation in Holy Communion, letting the Lord's Presence touch them as He wills. Tradition Four: Each Church fellowship should work with its leadership autonomously, except in matters affecting other Church fellowships or the Body of Christ as a whole. No individual, group or region should take any action in the Name of the Church, without consulting the group and its service leadership. Tradition Six: A Church fellowship ought never to directly endorse, finance, or lend the name of the Church to any related facility or outside enterprise, lest problems of money, prestige, property and prestige divert us from our primary purpose of reaching others. Tradition Seven: Every Church fellowship should strive to become fully self-supporting by its members voluntary contributions, declining outside support. Money should be used to further the mission of the Church, not to accumulate, beyond prudent reserves, for no stated Church purpose. Tradition Eight: Our Church should be run primary by the members using their gifts from God. But our service centers for the Church may employ special workers in the five fold ministries; except in the day to day outreach of the Twelve Steps. Tradition Nine: The Church as such should not be overly organized. The service ministries should arise and be filled as needed as callings from the God through the members. Service always comes first for both the leadership and the members. Tradition Ten: The Church has no opinion on outside issues, the name of the Church should not be drawn into public fads or controversy; especially concerning politics and personalities or the direct criticism of other fellowships or religions. Tradition Eleven: Our public relations policy is based upon the witness of attraction rather than promotion; we need to maintain low, personal profiles in the Church, focusing more on the Message and less on ourselves. Tradition Twelve: Anonymity in Christ is the spiritual foundation of the Church's traditions, ever reminding us of our equal place in the Lord and the call to elevate Him and Gospel principles before personalities. This is the way to practice humility and to live in praise and reliance on the Lord in all things. STAND UP FOR JESUS NOW, SO YOUR GOOSE WON'T BE COOKED!